The airplane pilot's failure to see and avoid the helicopter while in the traffic pattern, which resulted in a midair collision between the two aircraft. Contributing to the accident was the airplane pilot's misunderstanding of the helicopter pilot's intentions and the airplane pilot's expectation that the helicopter would be clear of the runway. 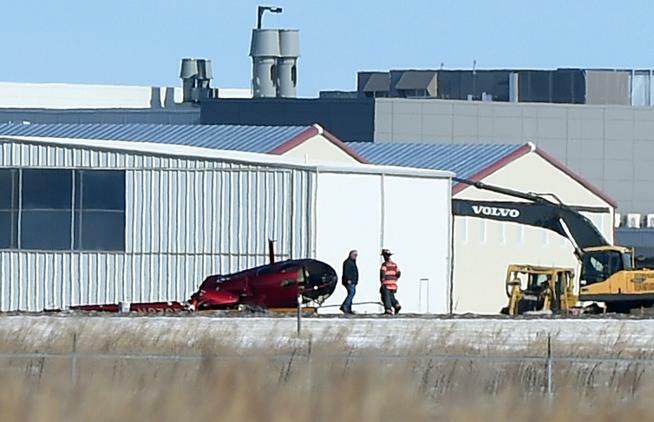 On January 26, 2018, about 1140 mountain standard time, a Robinson R44 II helicopter, N878BC, and a Beech A36 airplane, N777YF, collided while on approach to the Fort Collins-Loveland Municipal Airport (KFNL), Loveland, Colorado. The pilot in the helicopter sustained minor injuries and the pilot and passenger in the airplane were not injured. The helicopter was owned and operated by a private individual and the airplane was owned and operated by Landsgaard Equipment Leasing LLC. Visual metrological conditions prevailed at the time of the accident. The helicopter departed Century Helicopters Heliport (0CO7), Fort Collins, Colorado, at 1100, and the airplane departed the Greely-Weld County Airport (KGXY), at 1110. Both intended to land at KFNL. According to the helicopter pilot, when he approached KFNL, he announced on the common traffic advisory frequency, his intention to fly the RNAV GPS approach for runway 33. There was a National Guard UH60 helicopter flying the ILS 33 procedure. The pilots of the Guard helicopter intended to fly the ILS 33 to a missed approach, and then depart the area. The helicopter pilot informed them of his intention to perform the RNAV GPS 33 approach, perform the published missed approach procedures, and then enter the published holding pattern. He then heard the airplane pilot ask the UH60 if they intended to fly all the way to the end of the runway before turning east. They replied that they would be close to the end during the missed approach. The helicopter pilot continued the approach and the airplane pilot called that he was on the downwind, had the helicopter in sight, and would extend the downwind to give spacing. The helicopter pilot replied that he would fly the missed approach procedure and then return to the airport. The helicopter pilot heard the airplane pilot reply, "good." While descending towards the airport, the airplane pilot asked the helicopter pilot if he was stopping there, which the helicopter pilot replied that was still descending, and then intended to fly the missed approach. The airplane pilot then stated that he was passing overheard. Shortly after, the helicopter and the airplane collided. According to the airplane pilot, he approached KFNL from the east, and announced his initial position of 6-7 miles out. He heard other traffic conducting missed approaches and reported 2 miles and 1 mile out to coordinate with the local traffic. He announced crossing the field for the left downwind for runway 33 and proceeded into the pattern. While on the downwind leg for 33 and abeam the numbers he lowered the landing gear in preparation for landing. About that time the other pilot announced a straight in approach for 33, the airplane pilot saw that the aircraft was at a higher altitude, but he could see the aircraft was coming in on the approach approximately 4-5 miles out. On the radio, the airplane pilot offered to extend the downwind leg to allow the aircraft to complete its missed approach. On the base turn to final, the airplane pilot realized that the other aircraft was a helicopter and not an airplane. The helicopter continued its approach and when it was over the airport fence, the airplane turned onto final approach. 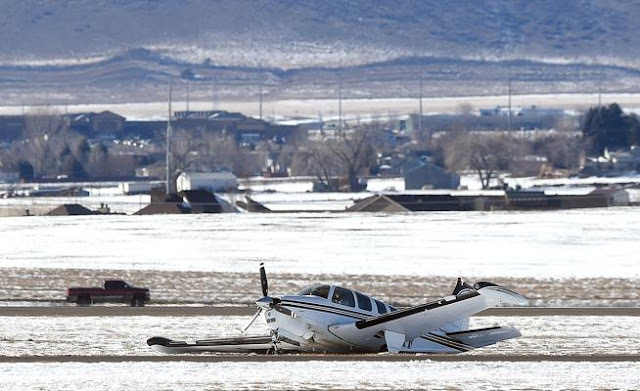 About 4 miles south of the runway the airplane pilot said he could see the helicopter hovering south of the runway threshold, about ½ to ¾ mile from the end of the runway. He queried the helicopter pilot about his intentions, and he heard the helicopter pilot say that he was going to hover for a bit and then depart to the east. The airplane pilot replied "okay" and stated that he intended to fly over him for a full stop landing. 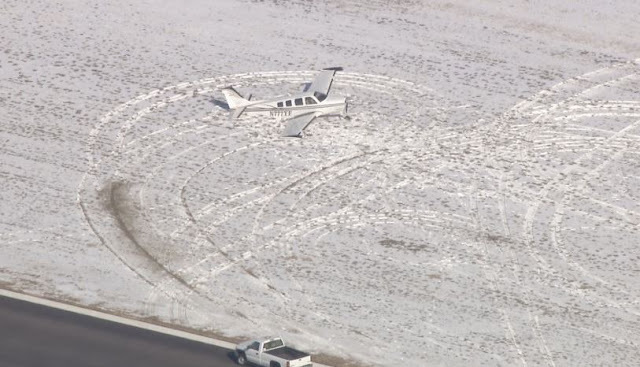 The helicopter pilot responded "okay," so the airplane pilot proceeded to land on runway 33. During the approach, the airplane pilot lost sight of the helicopter. Expecting the helicopter to remain in a hover south of the runway, the airplane continued to land, descended, and collided with the helicopter. The helicopter descended, impacted terrain, and rolled on its right side resulting in substantial damage to the fuselage, and tailboom. After colliding with the helicopter, the airplane pilot saw the gear indicator show an unsafe right main landing gear. The airplane touched down on the left main landing gear and the pilot kept the right wing up for as long as possible. As the airplane slowed, the damaged right main touched down and the airplane departed the right side of the runway and came to rest in the adjacent grass. The responding Federal Aviation Administration Inspector auditioned audio from the UNICOM frequency. He did not hear the helicopter pilot transmit that he intended to hover. The airplane pilot stated that east of the runway 33/15 is where the local helicopter traffic usually performs their training, so he was expecting this helicopter to do the same. According to the helicopter, when he approached KFNL, he announced on the common traffic advisory frequency, his intention to fly the RNAV GPS approach for runway 33. There was a National Guard UH60 helicopter flying the ILS 33 procedure. The pilots of the Guard helicopter intended to fly the ILS 33 to a missed approach, and then depart the area. The helicopter pilot informed them of his intention to perform the RNAV GPS 33 approach, perform the published missed approach procedures, and then enter the published holding pattern. He then heard the airplane ask the UH60 if they intended to fly all the way to the end of the runway before turning east. They replied that they would be close to the end during the missed approach. The helicopter pilot continued the approach and the airplane pilot called that he was on the downwind, had the helicopter in sight, and would extend the downwind to give spacing. The helicopter pilot replied that he would fly the missed approach procedure and then return to the airport. 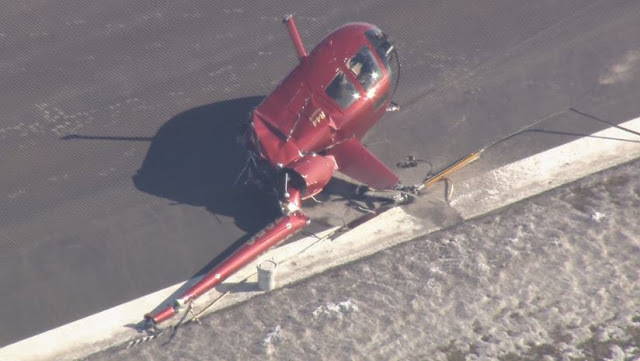 The helicopter pilot heard the airplane pilot reply, "good." While descending towards the airport, the airplane pilot asked the helicopter pilot if he was stopping there, which the helicopter pilot replied that was still descending, and then intended to fly the missed approach. The airplane pilot then stated that he was passing overheard. Shortly after, the helicopter and the airplane collided. According to the airplane pilot, he approached KFNL from the east, and announced his initial position of 6-7 miles out. He heard other traffic conducting missed approaches and reported 2 miles and 1 mile out to coordinate with the local traffic. He announced crossing the field for the left downwind for runway 33 and proceeded into the pattern. While on the downwind leg for 33 and abeam the numbers he lowered the landing gear in preparation for landing. About that time the other pilot announced a straight in approach for 33, the airplane pilot saw that the aircraft was at a higher altitude, but he could see the aircraft was coming in on the approach approximately 4-5 miles out. On the radio, the airplane pilot offered to extend the downwind leg to allow the aircraft to complete its missed approach. On the base turn to final, the airplane pilot realized that the other aircraft was a helicopter and not an airplane. The helicopter continued its approach and when it was over the airport fence, the airplane turned onto final approach. About 4 miles south of the runway the airplane pilot said he could see the helicopter hovering south of the runway threshold, about ½ to ¾ mile from the end of the runway He queried the helicopter pilot about his intentions, and he heard the helicopter say that he was going to hover for a bit and then depart to the east. The airplane pilot replied "okay" and stated that he intended to fly over him for a full stop landing. 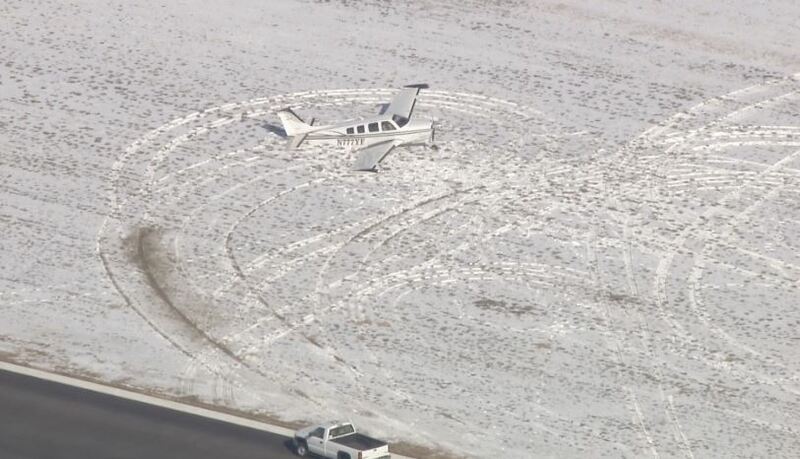 The helicopter pilot responded "okay," so the airplane pilot proceeded to land on runway 33. During the approach, the airplane pilot lost sight of the helicopter. Expecting the helicopter to remain in a hover south of the runway, the airplane continued to land, descended, and collided with the helicopter. The helicopter descended, impacted terrain, and rolled on its right side resulting in substantial damage to the fuselage, and tailboom. After colliding with the helicopter, the airplane pilot saw the gear indicator show an unsafe right main landing gear. The airplane touched down on the left main landing gear and the pilot kept the right wing up for as long as possible. 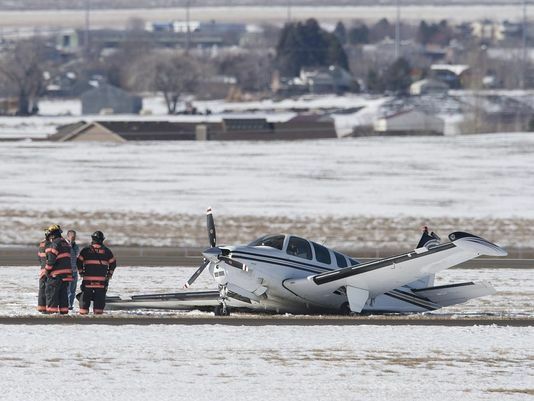 As the airplane slowed, the damaged right main touched down and the airplane departed the right side of the runway and came to rest in the adjacent grass. I get nervous anytime I see or hear a helicopter in the airport traffic pattern. Bad things tend to happen when they get too close together. There's a video on Youtube of a Cirrus landing right after a large military helicopter departed and he catches the rotor wash and it flips him inverted just as he's in the flare causing him to crash. Luckily he wasn't killed.